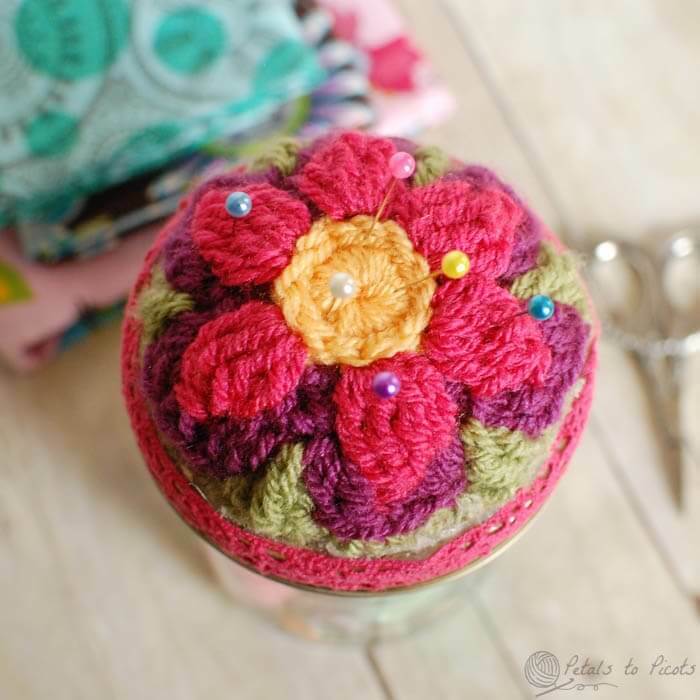 I have long wanted to make a crochet pin cushion for my desk but couldn’t settle on a design. 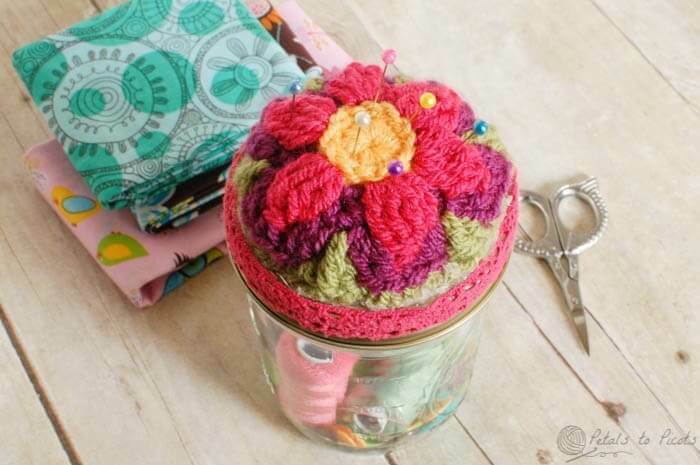 But when I saw these Mason Jar Sewing Kits that my friend Meredith made, I knew what I wanted to do! I basically just followed Meredith’s tutorial, but instead of fabric, I used a round crochet motif. Pretty fun, huh? I just played around to come up with this one. I have to sit down and see if I can recreate it and write out the pattern for you. But in the meantime, any round motif will do. I love being able to see my colorful threads and buttons! Is there a tutorial for this somewhere? Thank you! I LOVE this project for a Christmas present….the colors you chose for your yarn are absolutely gorgeous, Kara! Hi Kathy 🙂 I used a very thin line of hot glue to adhere to p edge to the cap. Just be careful not to use to much or else the cap won’t screw on the jar properly. Hope that helps! absolutely magnificent – you have just solved my xmas gift giving! i, also, will anxiously be waiting for the pattern. thank you so much! Great idea and so bright and happy looking! so cute. I will be watching for the pattern. What a colorful creative idea. I’m think this would make a great gift, filling it will simple everyday sewing kit items. Te quedo lindo, es bueno ver lo que esta dentro!!! This is so beautiful, Kara! I love the colors you chose and is that “washi lace tape” that you used for the rim? LOVE it! that is super cute. i like the idea that it is multi-funcitonal!